In the midst of a lengthy binge on Johnnie To movies, preparing for a They Shot Pictures episode we hope to record this weekend, I’ve tried to fit in a few other Hong Kong films that I thought might have influenced, or been influenced by To’s work. 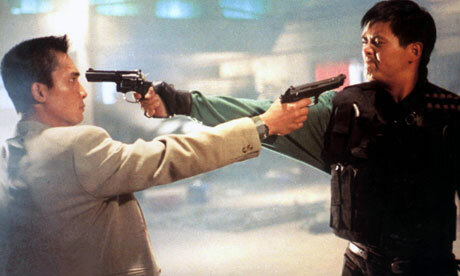 I rewatched Ringo Lam’s City on Fire and John Woo’s 1986 A Better Tomorrow, two of the first Hong Kong movies I ever saw way back in the late 90s and the latter of which I’m now convinced is not only one of the most influential movies of the last 25 years, but also one of the best. I also watched the one major Woo film that had previously eluded me, his Vietnam epic Bullet in the Head, featuring a star-making turn from future To regular Simon Yam. Additionally I finally watched Peter Chan’s acclaimed romance Comrades, Almost a Love Story, a movie that doesn’t appear to have had much impact on To: his romances are almost always more tongue-in-cheek (with the notable exception of Linger, which might be the most inert film he’s ever made), though his 2003 film Turn Left, Turn Right is a kind of variation on the last 20 minutes or so of Chan’s film. The least interesting film I watched was The Heroic Duo, by Benny Chan, a To-knockoff with Ekin Cheng and Leon Lai playing a cat and mouse cops and robbers game (think Running Out of Time) with a silly supernatural gimmick (Lai can hypnotize people just by staring into their eyes and asking them highly personal questions). The last film I watched is Andrew Lau and Alan Mak’s smash 2002 hit Infernal Affairs, a film impossible to imagine without Johnnie To’s Milkway Image cops and gangsters movies (The Mission, The Longest Nite, Expect the Unexpected) that nonetheless proved far more financially successful than any of To’s films had been to that point. The first time I saw it was shortly before Martin Scorsese’s remake The Departed was released in the fall of 2006 and it was weird coming back to it almost a decade later, having seen Scorsese’s version a few times since its release. The plot, if you’re not familiar, follows two undercover agents: Tony Leung (Leonardo Di Caprio in the remake) plays a cop who has infiltrated a Triad gang and Andy Lau (Matt Damon) is a gangster who has infiltrated the police. Both characters rise to a trusted position and are each ultimately tasked with uncovering the other as both sides become aware that there’s a mole within their group. Infernal Affairsclocks in at a mere 100 minutes, lightning-fast by the standards of contemporary American film, where even the slightest of romantic comedies regularly slog past the two hour mark, which I think reveals something interesting about the ways the two industries (Hong Kong and Hollywood) work. The running time difference is not merely the result of the remake having added more story. Though it does integrate some elements of Infernal Affairs’s two sequels, this amounts to maybe fifteen minutes or so of the extra time. The only major transformation of the narrative The Departed makes to the original (one which has no real major effect on the running time) is to combine the two female characters into one person. Instead of Andy Lau having a girlfriend (Sammi Cheng) and Tony Leung having a therapist (Kelly Chen) with whom he has a platonic friendship, Scorsese gives us only one character: Vera Farmiga as both Damon’s girlfriend and Leo’s therapist. This adds an element of wild metaphysical coincidence, as if there’s only room for one woman in this hyper-masculine gangster world. In this respect, an improbable coincidence that reinforces the doubling between the hero and villain, the Scorsese movie is actually more Johnnie To-like than the original, as many of To’s films are built around chance and fate. Scorsese gives the material a further complication by having DiCaprio sleep with Farmiga (something Leung does not do in the original), the professional rivalry between the two men thus becomes a sexual one as it’s implied that Damon is impotent while Leo is. . .the opposite. Scorsese films are littered with sexual insecurities and rivalries between men, so this addition thus makes the film even more his own. So it’s not story changes that account for the difference in length between the two films. Rather it is the approach to characterization, genre and action. The kind of ruthlessly efficient filmmaking on display in Infernal Affairs is typical of the output of a genre-based studio system that relies on familiarity, both with character types and the various actors’ star personae, to do a lot of the narrative background work, much like Hollywood’s pre-Code gangster or ‘good-bad woman’ cycle, the films of which rarely clock in at more than 75 minutes. Scorsese’s film, by comparison, has to take its time developing its characters, because every Leonardo DiCaprio performance is different and this particular type of cop movie is fairly rare in modern Hollywood, where crime films are built more around action set-pieces (Michael Mann’s Heator Michael Bay’s Bad Boys, to take examples from two extremes, though it should be noted that hero-villain doubling is an essential part of Mann’s film) or gruesome bits of horror (David Fincher’s Se7en, or Jonathan Demme’s Silence of the Lambs). Hong Kong fans can just look at a massive star like Andy Lau and know that he’s a cool, charming striver who might be a bit stiff, a bit amoral, but is probably a decent guy, while Tony Leung always looks anguished and his goatee tells you he’s done bad things he regrets (he also played almost the exact same role in John Woo’s Hard-Boiledten years earlier: a cop who’s been undercover too long) but is almost assuredly the hero (a notable exception is in Johnnie To’s The Longest Nite, where Leung plays a very dirty cop who somehow manages to still elicit audience sympathy by the end of the film, partially because he’s Tony Leung and he’s a great actor and partially because he isn’t quite as bad as the gangsters trapping him). Similarly, Sammi Cheng’s character is given almost no dialogue or character, but she is also major pop and movie star in Hong Kong who we know well from her other work, especially her prior films with Andy Lau, like Johnnie To’s Needing You and Love on a Diet. Additionally, Infernal Affairs was merely the latest in a long string of so called ‘heroic bloodshed’ films, inspired by A Better Tomorrowand City on Fire: films about cops and triads with elaborate codes of honor and where the mirroring identification of hero and villain is a recurrent trope (see also Woo’s The Killer and Hard-Boiled, To’s The Big Heat, The Longest Niteand Running Out of Time among many others). These films in turn are a continuation of older traditions, such as the Shaw Brothers films of the late 60s and 70s, especially those directed by Chang Cheh (One-Armed Swordsman, Crippled Avengers) and the samurai movies of the 50s and 60s, especially those of Akira Kurosawa (Seven Samurai, Yojimbo). The audience for Infernal Affairs was likely familiar with many of these antecedents, even if they weren’t conversant with the films that had originally inspired them (American gangster films and film noir, Spaghetti Westerns, Jean-Pierre Melville’s crime movies, the whole history of action-adventure literature in Japan and China, American hard-boiled fiction and so on). A filmmaking culture with a strong genre- and star-based system is able to cut narrative corners based on the assumption that the audience will be able to follow along simply because they’ve seen this kind of thing, by these actors (or actors much like them) before. The Departed is almost an hour longer than Infernal Affairs, and much of that difference is in giving character-defining speeches and actions to the performers, as well as in the Hollywood-mandated repetition of key plot points in order to create the relatively unique generic world. The other big difference is in the approach to the violent sequences. Infernal Affairs is very matter-of-fact in its depiction of violence: it erupts suddenly and is over quickly. Scorsese though follows a build-and-release model, where suspense and tension accumulates over the course of a scene (often while Jack Nicholson is making a crazy speech) before being capped by an act of graphic violence. Take for example the breaking of Leung/DiCaprio’s cast. In both films, the undercover cop is wearing a hard cast on their forearm when the top gangster begins to suspect there’s a mole in his group. We’re shown before the scene begins that the cop will be wearing a wire, the implication being that it will be located in the cast. In Infernal Affairs, the gangster, with no lead up, simply grabs Leung’s arm and smashes it on the table just as their criminal scheme has been foiled. The violence is shocking, and the fear that Leung has been exposed is quickly felt and just as quickly resolved as no wire appears. In The Departed, the action takes place sometime after the scheme has been foiled. DiCaprio meets Nicholson in a bar and listens to him talk. They go to a back room where Nicholson talks some more (the tension here is all verbal: Nicholson can explode at any time (something we know well from his star persona) and we’re in a constant state of anticipation/dread). Ray Winstone, playing Nicholson’s enforcer calmly walks up, takes DiCaprio’s arm, and smashes the cast on a pool table. Nicholson then hammers his hand a few times with a boot, in case he (or we) didn’t get the message (Nicholson is angry with DiCaprio and doesn’t entirely trust him). Again, the wire is not there and DiCaprio’s cop remains safe, if rattled. It takes four minutes for Scorsese to cover the same story terrain Infernal Affairs accomplished in 15 seconds. The difference here is simply one of approach. Infernal Affairs is all quick, punctuating violence, violence that appears and disappears with no warning, no time to prepare. The Departed, on the other hand, creates a palpable dread. It very much wants to put us inside the mind of DiCaprio, to feel the kind of paranoia and pressure he has to deal with every day in his life as the only good guy in a world of very scary men. The Departed is as much about the psychology of violence as it is anything else and it creates a world dominated by this kind of pathological fear. Infernal Affairs is about tracing an intricate web and much of our enjoyment comes from watching the ways it plays on and varies its generic forebearers. To drastically simplify: in The Departed, we identify with the characters, in Infernal Affairs, we admire the filmmaking craft. 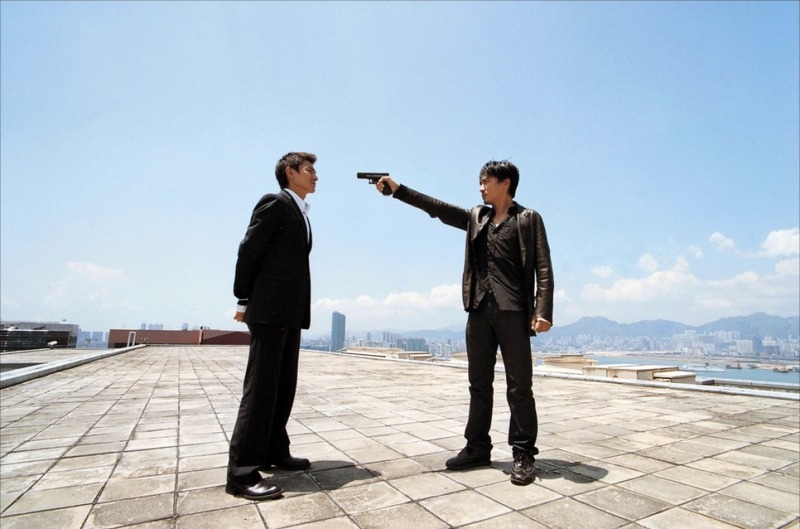 The success of Infernal Affairs certainly inspired a burst of creativity from Johnnie To, as he followed it up with his greatest cops and gangsters films, movies that challenged and critiqued the genre more successfully than he ever had before. Where his 1999 The Mission is a perfect expression of the heroic bloodshed genre, later films broke down and analyzed the genre’s ideals, codes, and psychology from within both the cops (PTU, Breaking News, Mad Detective) and the gangsters (Exiled, Vengeance, the Election films). None of these films managed to be as popular as Lau and Mok’s film, though they did win To critical acclaim both in Hong Kong and around the world. As yet, none of them have been remade in Hollywood. Great read. I love how you teased out the way in which the films differ and how we go about enjoying them in different ways as a result. One thing I've come to appreciate about the action films of the Orient of this ilk is that no-nonsense we tell you once and then go on approach. For someone like me who hates enduring exposition, it makes the films a lot more engaging and effortless to watch. Also, this is a reminded I need to start watching more To. the hot tub time machine quotes body weight. Dealers exist in the UK due to the malfunction of one of its features. There are several types of hot tub covers. Such additional features you are looking for in it.